One of Yahoo’s senior international execs and longtime entrepreneur Ahmed Nassef is leaving the company to create a new startup called Telfez, which will be a social television effort aimed at emerging markets. Nassef, who was until now the head of Yahoo’s efforts in the Middle East and Africa, is co-founding the new company with Tamer Rashad, a top Merrill Lynch in the same region. Telfez will be based in Palo Alto, Calif.
“Today the Middle East and Africa region represents an inflection point for television viewership, skyrocketing growth in the penetration of smartphones and connected devices, and heavy social engagement,” said Nassef in a press release. “Increasingly, the millions of TV viewers in places from Capetown and Casablanca to Dubai and Istanbul are watching TV while holding a mobile phone or tablet and connecting with friends on their favorite social platforms. Nassef has been at the Silicon Valley Internet giant for four years, in which he has doubled its audience and improved revenue growth. 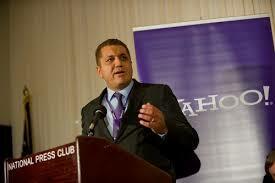 He came to Yahoo after the company acquired Maktoob.com, an Arabic language site, in 2009.